If we do not arrest the current rate of overfishing, our oceans could be depleted of fish by 2048. Following Arwa’s recent blog on shark finning in the United Arab Emirates – a cruel and destructive practice that produces the so-called delicacy that is shark fin soup, and another story about the turtle that pooped plastic for a month, we’re relieved to offer a potential solution. Like Al Gore’s The Inconvenient Truth, which enlightened millions about the dangers of global warming, The End of The Line has the power to educate the masses about our destructive fishing practices. Global Ocean will be screening the documentary throughout the UAE this May. Find out more about the film and Global Ocean after the jump. The End of The Line premiered at the 2009 Sundance Film Festival and has since received international acclaim. The documentary followed investigative reporter Charles Clover as he traveled the world for two years to interview politicians, celebrity chefs, and a host of other people contributing to the rapid decline of fish in our oceans. Seemingly innocent habits – such as ubiquitous sushi consumption outside of Asia – has led to the near extinction of the magnificent marine predator Bluefin Tuna. The consequences of our ignorance, however, are serious. 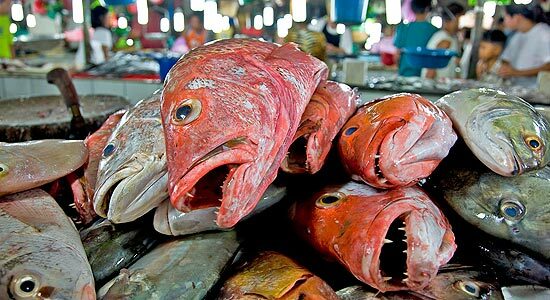 At the current rate of overfishing, we could lose almost all species by 2048. Unless we act now. Global Ocean is a non-profit organization that helps marine conservation programs increase their impact. They are particularly interested in how the arts can foster awareness and then action. Following are details of screenings in the UAE, where certain environmental specialists will be available to discuss the film. Wednesday May 4th: United Arab Emirates University; Panel: Rashid Sumaila. A shorter, 20 minute version of the documentary will also be shown at several schools, where surveys will be distributed to gauge the level of conservation awareness among school-aged children. Seafood is an important source of protein for millions of people. Without it, there could be widespread starvation. The film outlines certain simple but effective solutions that can arrest the accelerating decline of fish in our oceans. Previous Previous post: Should You Breastfeed Your Baby After Exposure to Nuclear Radiation?